Many years ago we visited an area of France called La Brenne which is noted for its breeding population of Purple Herons. Still using the excellent but very slow (50 ASA) Fuji Velvia film in those days, and not having enough lens, though we saw Purple Herons I failed to capture a decent picture of one. 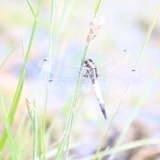 The trip also preceded my interest in dragonflies though I did get a rather poor picture of a dragonfly which I recently suspected to be a White-tailed Skimmer (Orthetrum albistylum). The White-tailed Skimmer doesn’t occur at home and is difficult to distinguish from the Black-tailed Skimmer (Orthetrum cancellatum) so, this trip, I’ve been keeping a close watch on all suspects in the hope of securing a decent photograph to replace my earlier poor effort. Whilst I quite like my camera, there are situations in which I find it frustratingly annoying. Its most irritating behaviour is when the autofocus logic steadfastly refuses to focus on an admittedly very narrow subject such as a damselfly. Even though the damselfly is closer, it frequently insists on focussing on the background instead. It just doesn’t seem to “see” something as thin as a damselfly. It serves as regular reminder of a comment I once heard made by Andy Rouse, a professional wildlife photographer now using Nikon equipment, that “even a Canon could focus on that”. Interesting! Its other frustrating feature is the manual exposure exposure setting which, other than for flash shots, I never use. Naturally, any decent camera would include a manual exposure facility but what’s frustrating about it is that I seem to manage inadvertently to set my camera to manual exposure mode on occasion. I can only imagine that it happens when putting the camera away or taking it out of its rucksack. User error! 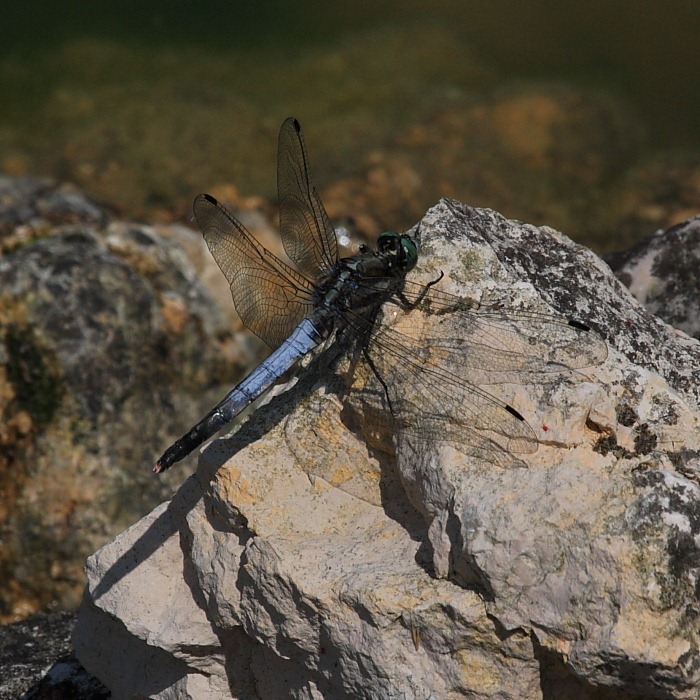 Whilst at Figeac, I was tracking a suspect which did, indeed, turn out to be a White-tailed Skimmer. After cruising up and down the bank for a while it finally settled on some grass causing Franco to leap hastily into action and fire off two quick shots before it once again took to the wing. I was thrilled – my long-awaited decent shot of a White-tailed Skimmer. My delight was short lived as I noticed the camera had been set on manual exposure and the image was hopelessly overexposed. I’ve got to show you this un-doctored version to give you a laugh. It could be somewhat recovered by post-processing but would never be great with the burned-out areas. I was livid! Mercifully fortune offered me a second chance recently. We were just about to pack in and go shopping when I spotted another suspect zooming back and forth along a lake shore. I knew what to look for now and was pretty sure it was a White-tailed Skimmer. It settled on a rock. I checked the camera [Ed: novel idea, Franco!]. It remained settled and I clicked off a few shots. I checked the image and all looked good. Relief! 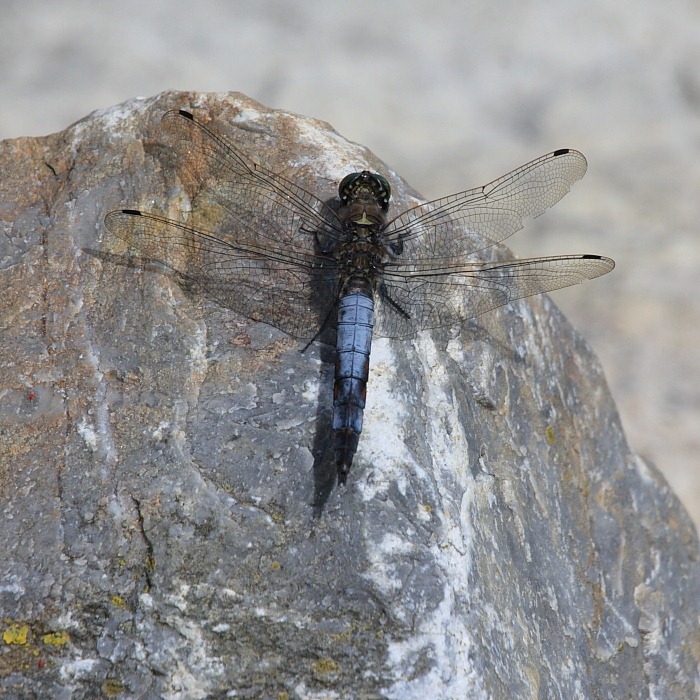 For those keen on puzzles and just for a bit of fun, here’s another recent picture of a very similar Black-tailed Skimmer also sitting on a rock, though at a different angle. In an exam, this could form the basis of one of those “compare and contrast” type questions, couldn’t it? Camera’s changing their settings is a problem that besets more than your good self, mine has a mind to change its setting, I think its down to the mode dial rubbing on my hip …. most frustrating when you are hoping for a speedy shot and it ends up all wrong! I’ll take a little comfort from the fact that it isn’t just me. Thanks!